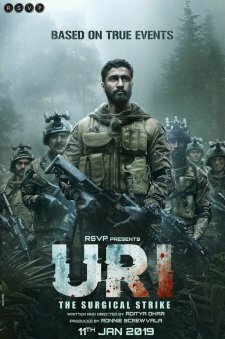 Uri (2019) - January 11, 2018 - Trailers, Review, Songs, Images, News, Synopsis, Plot, Cast & Crew, Wallpapers, Video Clips, Box Office Collection, Hit or Flop, Verdict starring Vicky Kaushal, Yami Gautam, Paresh Rawal. It is directed by Aditya Dhar and it is all set to release on 11th January, 2019. Uri is one film that *should* be watched… Absorbing screenplay, superbly executed combat scenes, efficient direction [Aditya Dhar]… Uri is thrilling, gripping, instills patriotism, without getting jingoistic. Based on the surgical attacks planned and executed by the Indian Army in 2016, Uri explores different attacks that took place before the attack and the last straw which forced the Indian government and the army to take such actions. Vicky plays Major Vihaan Shergill who leads the mission against the terrorists. The film is divided into five chapters. Each chapter is told through Vihaan's perspective.